Active MediaMagnet is a useful utility to create promotional messages or press release messages to send. This utility has built in capability to announcements to media contact. 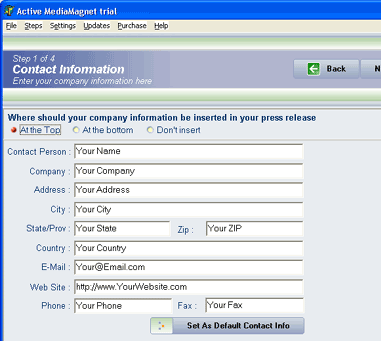 Application allows you how to create your own media contact or use the update from MediaMagnet. Features: Application has a very nice user interface. You need to follows simple four steps to complete the process. In first step enter your company information like contact person, company name address, email address, web site, phone etc. You also need to select an option where your information should be inserted in press release like at the top, at the bottom or don`t insert. In the next step enter press release information. It has an in-built editor to write your email message. In editor you can insert table, insert link, set background color, foreground color etc. Select email format as HTML or plain text. Set release date as immediate release or release at specified date or no release date. Enter email subject and headline. In the next step select database from the list of available media, you can search media by keyword, select the media from the list. In the last step you can see release preview, how your press release will look like. You can perform any or all the activities like send releases, print releases and print labels. Application allows you to set preference for email settings and removal notice to set email account. In email settings you can specify return email address, email connection, time out, SMTP server, SMTP port, user account and password. Overall: It is an excellent web promotion utility for promoting your web site, products, businesses, services etc. Active Media Magnet is the first software product that completely automates your press releases management and internet publicity strategy. Now submitting your press releases to over 33000 media contacts, including newspapers, magazines, radio, tv, specialized media and more. Unleashes the true power of automated promotions to drive customers to your site. Add or edit your own media contacts or use our automatic media database updates.